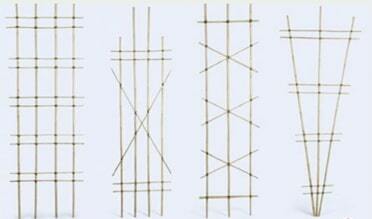 Bamboo stakes of various lengths can be used to make inexpensive supports for your vegetable plants. The easiest configuration is the teepee form, which supports itself without digging into the ground and consists of 3 or more poles lashed together on one end with the legs extended outward. This can be used for vining plants, tomatoes and any plant which needs support when it grows tall. 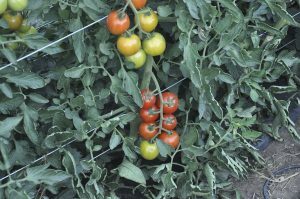 An easy support for tomatoes is 2 teepees with a sturdy pole running across the top of them and individual heavy strings dangling over each plant from the pole. As the plant grows, tie successive branches to the upright string. You can paint your bamboo to dress them up, or just leave natural. If you paint them, you may want to first wash them with a solution of ½ cup trisodium phosphate mixed with one gallon of water. You can use a latex enamel paint, but oil-based enamel would likely last longer. 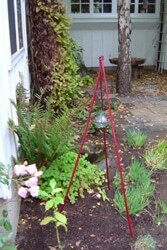 You can use twine, waxed lashing cord or colored 12-24-gauge aluminum craft wire for tying the poles together. Black lashing cord looks nice against natural bamboo. Twine and cord are tied with clove hitch knots to start, finishing with half hitches (see photos). You can use a similar method with wire without having to worry with making the beginning and end knots since the wire will bend to be secure. A-frames are self-supporting. An alternative design could use twine or wire mesh within a bamboo frame. See below for the lashing technique to bind bamboo poles together. For each connection, use a 4-5’ piece of cord. Vertical gardening has many advantages over conventional growing for plants like pole beans, cucumbers, squash, grapes, English peas, tomatoes, and melons. It uses less space, provides more air circulation, weeds are easier to remove, and you don’t have to step on the vines to harvest the fruit. The fruit stays cleaner and you can monitor ripening better. If you make your support strong enough to hold the plant, the plant will be able to support its fruit.